The Bata Shoe Company founded a sister company in Romania in 1930, with the purpose of organizing shoes trade in the country. In the year 1936 two other trading and manufacturing companies were set up – their operation ended at the beginning of the 1940s. Two other companies were founded in the years 1940-1942. The Bata Shoe Company business in Romania ceased after nationalisation (1948–1949). 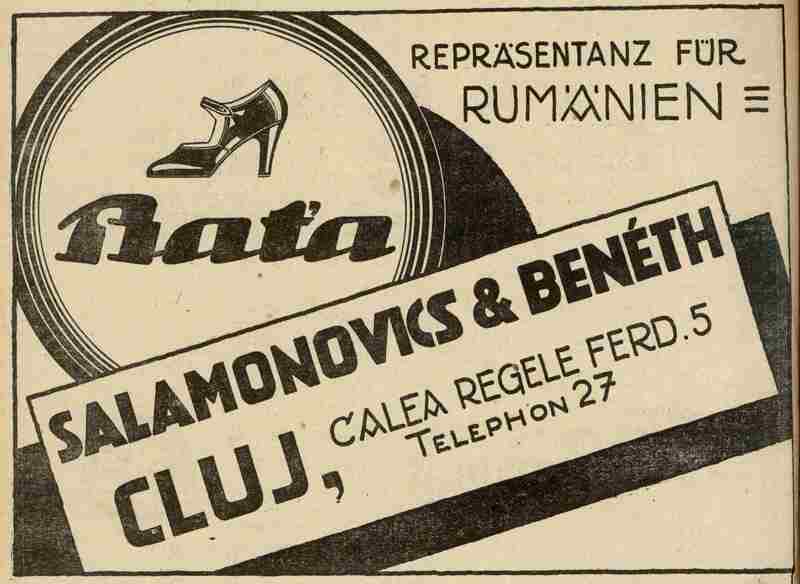 At the end of March of 1930 a sister company Bata S. A. R., Bucureşti (Bucharest) was established; the Bata company had several retail stores in Romania: Bucharest, Galac and Chisinau (today Moldavia). In 1932 stores in Chisinau, Galac and Bucharest were closed; the store in Bucharest was turned into a company warehouse. After the year 1932 the Bata Company did not have any own stores in the country, also the export of Bata shoes decreased: in 1933 – 133, 000 pairs, in 1938 – 73, 000 pairs. In the year 1936 a sister company Romcar S. A. R, Bucureşti (Bucharest) was set up, in 1936 – 1937 it built a factory for carbon black production in the town of Bucşani near Ploieşti; on 31st December 1940 the Company ceased to exist after a fusion with Bata S. A. R. Bucharest; in the year 1941 the product assortment of the factory Bucşani was expanded by production of creams. In 1936 another sister company Veloromana S. A. R, Bucureşti (Bucharest) was established for production and sale of tires; around the year 1940 the company Veloromana ended the tire sales and its premises were closed. In Bucharest on 21st May 1940 one more sister company Drata S. A. R., Bucureşti was set up with the purpose of shoe production and sale; at the beginning the firm had 6 stores; in the shoe factory the number of employees decreased from 110 (in 1940) to 87 (in 1942); in contrast the number of employees in stores increased from 20 (in 1940) to 55 (1942); shoe production decreased from 49, 000 pairs (in 1940) to 39, 000 (in 1943), the shoe sale was 123, 000 pairs (in 1940) while only 88, 000 pairs in 1943; in 1943 a new production hall was built in the factory, however it was destroyed in June of 1944 during the Allies airstrikes. By the Romanian government regulation from 1942, the company Romcar was prevented from any continuation of production. Under duress the factory was divested by force; the employees and cream production from Bucşan was transferred to the factory in Bucharest (into a factory complex of the Bata sister company Drata). On 25. 9. 1942 the Bata Company founded another sister company Cotva S. A. R., Bucureşti (Bucharest) for wholesale of various goods. Its operations were later limited to the trade with shoe cream of own production. During the war years the company Bata S. A. R., Bucharest had a stable number of employees: 11 persons (in 1939) – 16 persons (in 1943) and organised footwear trade. After the war the Bata companies in Romania were run under compulsory administration; the company Drata was nationalised in June 1948; the company Bata S. A. R was in insolvency at the end of 1949 and Cotva was liquidated.